Exfoliation is the first step to getting that silky smooth feeling that puts an extra bounce in your step. 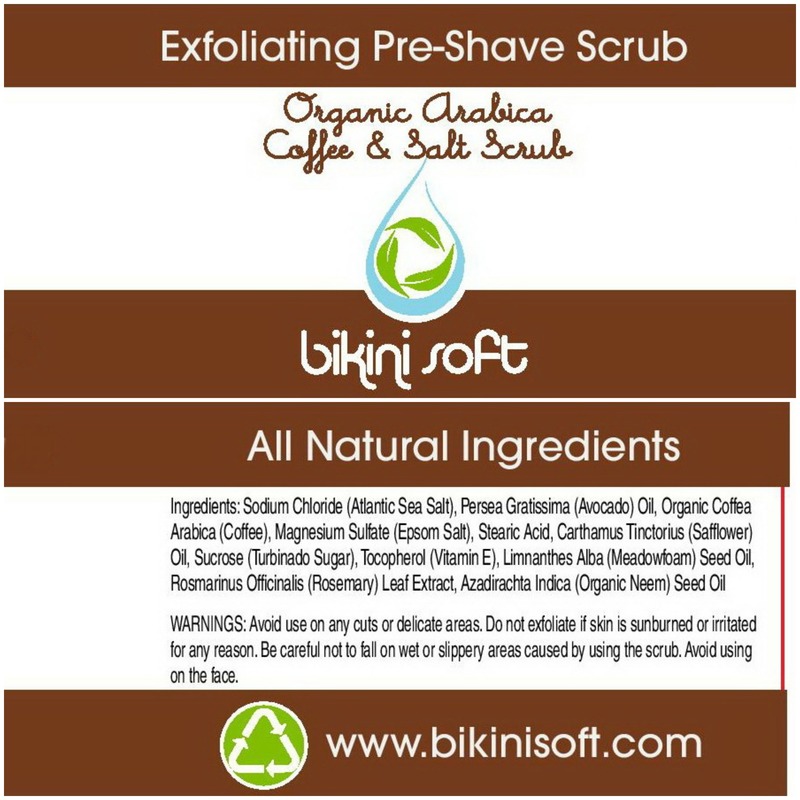 Bikini Soft Organic Arabica Coffee & Salt Scrub can be used alone for touchably smooth skin everywhere (even your face! 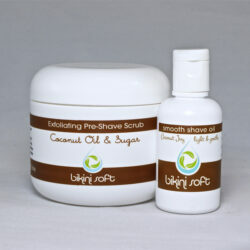 ), or for even better results, as a step 1 pre-shave scrub before our Coconut Joy or Vanilla Smiles Smooth Pre-Shave Oil. 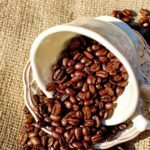 The warm, energizing coffee aroma is like a jolt of energy in a bottle! 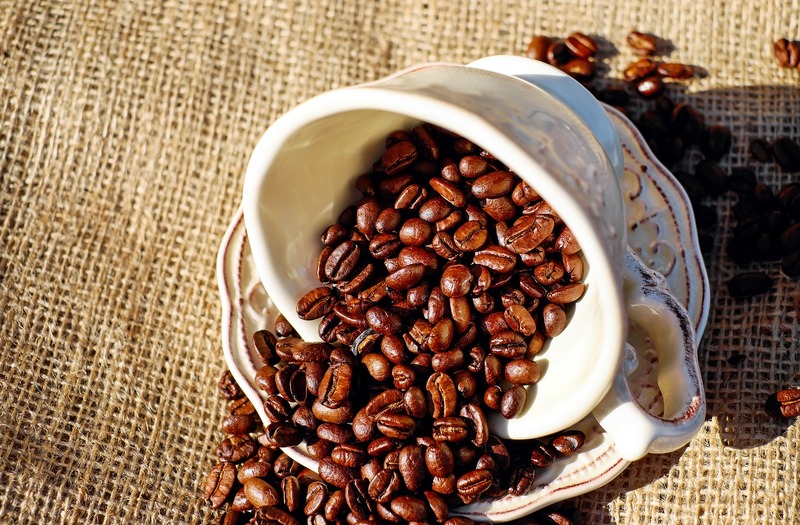 Plus—the organic coffee beans contain high levels of caffeine, a powerful cellulite fighter. Made with all natural ingredients, this coffee scrub is hypoallergenic, soothing, conditioning, and made with love in California. Extra sensitive skin? Try our less abrasive Coconut Joy Pre-Shave Scrub. Looking for even more exfoliation? Try our Citrus Bliss Pre-Shave Scrub with raw brown sugar. 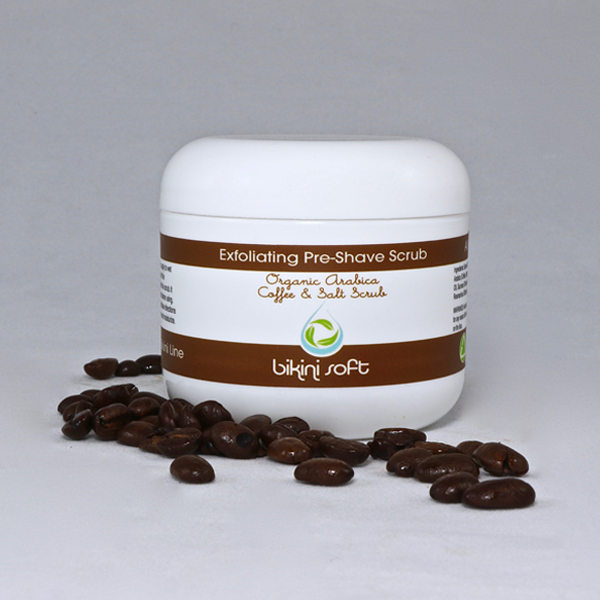 Our organic Arabica Coffee & Salt pre-shave scrub can be used alone for touchably smooth skin everywhere (even your face! ), or for even better results, as step 1 before our Vanilla Smile Smooth Shave Oil. Using our scrub couldn’t be simpler — scoop a little between your fingers, apply to wet skin and gently massage in a circular motion. You can also regulate the intensity of the exfoliation with the amount of water you use with the scrub. More water added means a gentler scrub, and vice versa. Our scrub is made with natural salt exfoliants, is never abrasive, and is gentle enough for daily use. I have tried many body scrubs and this one is simply terrific! I’m 19 years old and have suffered from extreme acne since I was 12. I bought this on a whim and started using it on my legs before shaving for a little extra smoothness. It worked really well as a pre-shave scrub. I then decided to try it on my face and after the first use I noticed my acne was lessening (improving). After two weeks it was GONE. This is something I could never say about any other product that I’ve tried in the last 5 years. It doesn’t dry out your skin or leave it irritated. I am in shock at how well it worked on my acne. This scrub really works well! I just ordered this last week and only tried it a few times, but I see and feel the results already. My skin has a nice glow to it. Additionally, I love the way it smells, and I don’t drink coffee. It’s not greasy like the other scrubs that I have tried (I just wished they would of provided a little spoon). 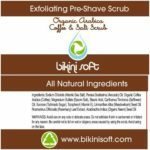 This scrub is great for use over all your body and works well as a pre-shave scrub or just as a body scrub. I’ve only used this product for a couple days but I absolutely love the smell. I’m not a big coffee fan but I love the smell of it. It is also very good at moisturizing my skin! It has improved my shave and my skin just feels softer. Love this product!!! WOW! I’m impressed! If you want a very nice body scrub that will leave your skin smooth and soft, and smells great to boot, this scrub is for you. I loved the texture and the combination of coffee salt and sugar. Very luxurious! Try it! I love the smell of coffee and the aromatic virtue of this scrub is simply wonderful! Even better it’s a fantastic skin softening and toning body scrub that is simply lovely! I really like it! Smells so good that you want to eat it! It really is pleasant and works like no other. My skin jus looks and feels so much nicer. I use it 3 to 4 times a week and my shaving experience is just better. Note that I sometimes just smell it early in the morning as a pick me up. Very nice product!